It's no secret that Bath is one of my all-time favourite UK cities. There's something so peaceful, calming and quite magical about the rows upon rows of terraced limestone fronted houses, cobbled paths, natural springs and incredible Georgian architecture. It's a feel-good city, if there's ever been such a thing. And so when the opportunity arose to visit again, this time with my boyfriend David in tow, I booked the date in the diary immediately. It was a lovely chance to enjoy all the benefits of a city break, without having to hop on a plane. I do love a good stay-cation! We debated booking a central hotel for the weekend, but when pricing it up - it was starting to look VERY expensive, even for the smallest room in a 3-star hotel. So we had to start thinking outside the box a little. I'd heard about the benefits of staying in serviced apartments from friends - your own space, the option of your own kitchen, a more 'home away from home' experience. And after scouring the web for a short while, I came across SACO apartments - who offer stylish accommodation options in all major UK cities. I was pretty blown away by how gorgeous their St James Parade apartments looked, and yet they were only charging £94 per night (on average). AMAZING! We swiftly booked in for the weekend. With its very own car-park (though make sure you ring ahead to pre-book your spot), you can drive straight in and head up to your very own apartment for the weekend. There is a slick modern kitchen - where they left us tea, coffee, milk and porridge for the morning, though we soon filled the fridge with all our favourite treats too. Then there's a large open living area, huge bathroom and a cosy bedroom with its own desk, wardrobe and TV. If you're visiting as a group, you can even book in for a two-bed apartment! Like most major cities, there was an abundance of restaurants to choose from during our stay - but obviously with my various intolerances, we're always a tad limited in where we can go. I usually ring ahead or check online to figure out if a place is going to be accommodating - and I was very impressed to find out that MOST places were able to offer vegan menus or tweak dishes around so that I wouldn't miss out. On our first evening we visited modern vegetarian restaurant Acorn, which is hosted in one of Bath's oldest buildings (within the same row of shops as Sally Lunn's). As a meat-eater, David was a little apprehensive about whether he'd leave feeling un-satisfied however we were both incredibly impressed by the delicious, multi-flavour dishes served here. I particularly loved the Garlic Dhal with onion and fried rice fritters, the latter of which tasted like incredibly creamy arancini balls that I usually have to skip as they contain dairy. While totally meat-free, not all the dishes are vegan here, however there is a plethora of options to suit a variety of dietary requirements. David and I are big fans of Indian cuisine, so this was one booking we were VERY excited about. And luckily despite the very high expectations, it didn't let us down. More of a fine-dining experience (yet without the pretentiousness) with opulent sparkling walls and intimate booths, each dish arrives beautifully presented and full of flavour. The scallops melted in the mouth, while David's lamb chops fell off the bone, with a sprinkling ginger, paprika and yoghurt topping. The Rogan Josh was beautifully cooked, with a delicate yet full flavour and the tandoori roti is totally dairy-free (just make sure you ask for it without the butter on top) which was VERY exciting for me, who usually has to miss out on the naan bread. Located in The Corridor, Dough has livened up the pizza scene by offering a truly customisable experience for their diners. Not only can you choose your toppings to create your very BEST plate of doughy goodness, but you can also tweak the dough, the type of cheese and even the shape. Yup, really! If you struggle to make big decisions (lets face it, pizza is a BIG decision) then you can opt for an item already on the menu - such as the 'Poker Pizza' which is star shaped with four different toppings and dressed with a mixed salad. Or you can switch up your dough - turmeric, gluten-free, hemp or black rice flour anyone? Before then customising your dream plate of cheesy, tomato goodness! Of course, one of the main attractions to Bath is their world famous Thermae Spa in the very centre of the city. 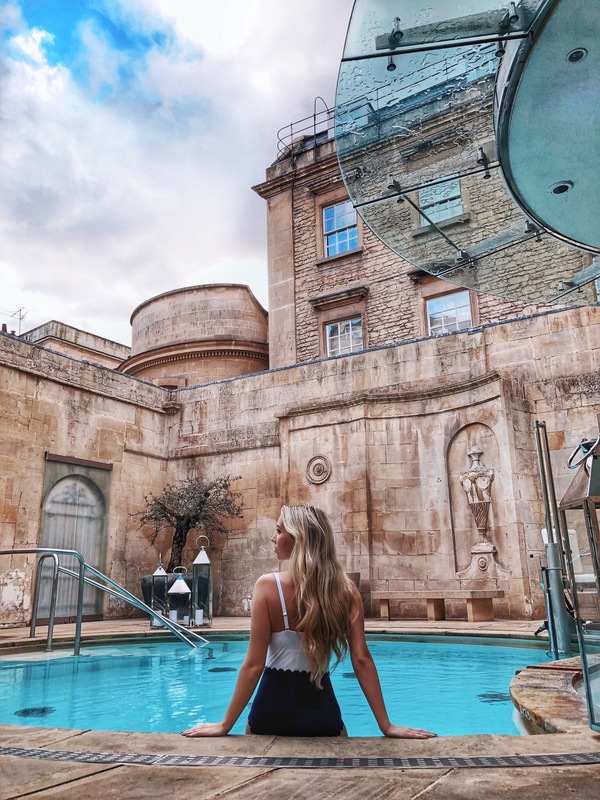 A fusion of the cities historic roots and the new contemporary modern world, the spa harnesses the city's warm, natural mineral-rich waters which the Celts and Romans enjoyed - and creates a place to relax, unwind and indulge your senses. There are four floors of pools, saunas, treatment rooms and even a restaurant - so you can quite happily while away the entire day here. The rooftop heated pool is pretty spectacular at night, so if you can time it right - I'd recommend doing so! There's also a private open air thermal bath which you can hire out for parties of up to 10 people and order in snacks, nibbles and prosecco - perfect for a very memorable birthday party or other occasion. 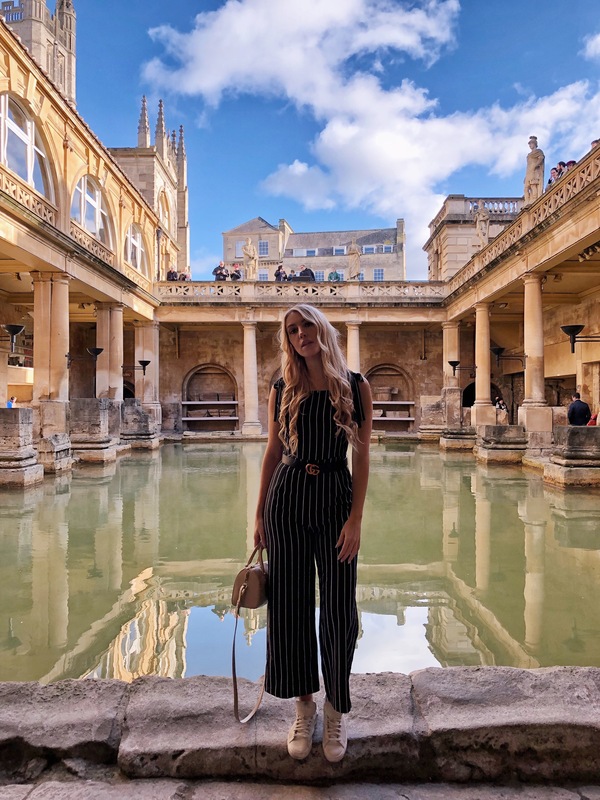 To unravel more of the cities famous history, head to the Roman Baths - which I've now visited on 3 occasions and each time, I've been amazed by how incredible and well-preserved a place it is. 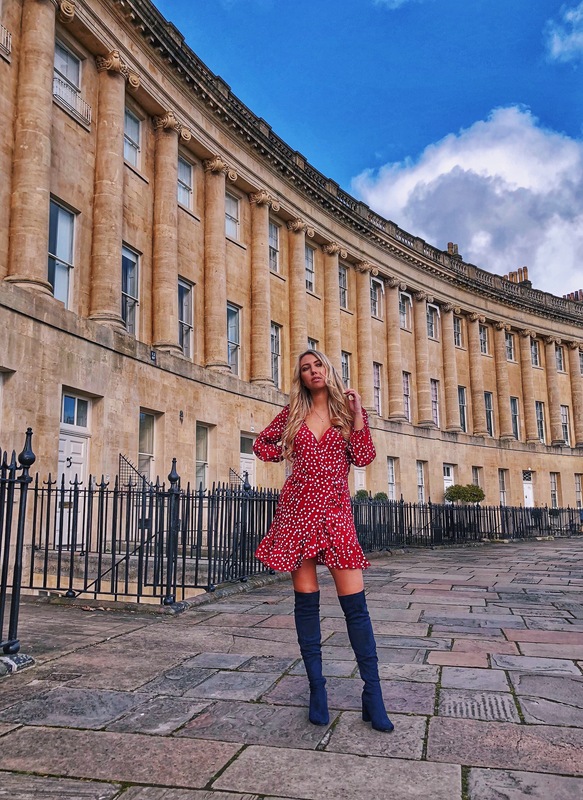 Bath is known for its sweet treats and so you can't afford to miss at least one of the variety of fudge and ice-cream offerings the city hosts. My personal favourite is the 'Fudge Kitchen', which is a cosy little store that hand-makes all of its fudge on marble slabs, in-house. The huge variety of flavours is admittedly overwhelming because everything tastes Oh SO good, but rest-assured they do offer samples so you can try before you buy. For the dairy-free eaters among us, don't worry about missing out - as the shop offers three vegan flavours. Of course, you can still try before you buy but I'd personally recommend the coconut vanilla fudge. The guy in the shop told me we could freeze it if we didn't finish the whole slab and it would keep for 3-6 months. It didn't even last the journey home. Which probably speaks volumes of just HOW could it was. Just an hour and 26 mins from London Paddington, Bath Spa station is jam packed on a Friday evening with commuters and those looking to escape the city for the weekend, alike. However we opted to drive, as we had the pleasure of borrowing the Vauxhall Mokka X for the weekend. Modern, comfortable and spacious, the face-lifted version of Vauxhall's small SUV has an amazing panoramic view of the road - which on the journey down, granted us with some beautiful views! We forget how gorgeous the UK is and how stunning the countryside landscapes can be! The Mokka X is super spacious and had plenty of room for my packing-for-a-month-motto whenever we go away on a UK break, with a huge boot area and the option to fold down the back seats easily if you need even MORE room. It's packed with incredible tech, and the seats are so comfortable they certainly take the edge off any Friday evening traffic jams. Plus it's very petrol efficient - we didn't have to fill up the tank once for a 244 mile round trip! Find out more about the Vauxhall Mokka X here. Have you ever visited Bath - or do you have any recommendations yourself? Next Post Am I A Bad Friend?